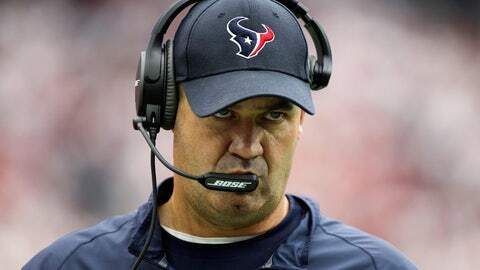 Bill O'Brien says despite perception, he doesn't have a short leash when it comes to benching players. The Houston Texans cut Randy Bullock this week after the veteran kicker struggled in last Sunday’s win over the Tampa Bay Buccaneers, missing an extra point and a field goal attempt. Bullock, who also missed an extra point in the the Week 1 to the Kansas City Chiefs, was replaced with on Tuesday former San Diego Chargers kicker Nick Novak. The Week 4 kicker swap was the second high-profile change the team has made thus far. In the season-opener, Texans head coach Bill O’Brien benched starting quarterback Brian Hoyer in favor of Ryan Mallett late in the game. Mallett has started every game since. Although the perception may be different, O’Brien, stressed the team seeks to avoid making any impulsive decisions when it comes to personnel. "I don’t think it’s ever — again, it’s a decision in the best interest of the team, but it’s never about one day," O’Brien said, per ESPN’s Tania Ganguli. "It’s never about one day, no. We really, really, really try hard not to make knee-jerk reactions around here, much to you guys’ surprise. We really try to think about things." Novak will make his Houston debut Sunday against the Atlanta Falcons.